It’s February and winter is slowly coming to its end, so let’s enjoy the last gorgeous wintry wedding shoots of this winter. Here’s one of them! This Colorado wedding shoot is all about warm firesides, delicious custom whiskey cocktails, and sleigh rides all added to the Colorado vibe of this look, without overdoing it. Just because your wedding venue is in the mountains, doesn’t mean your entire decor theme should be based around wood slabs and tree stumps. 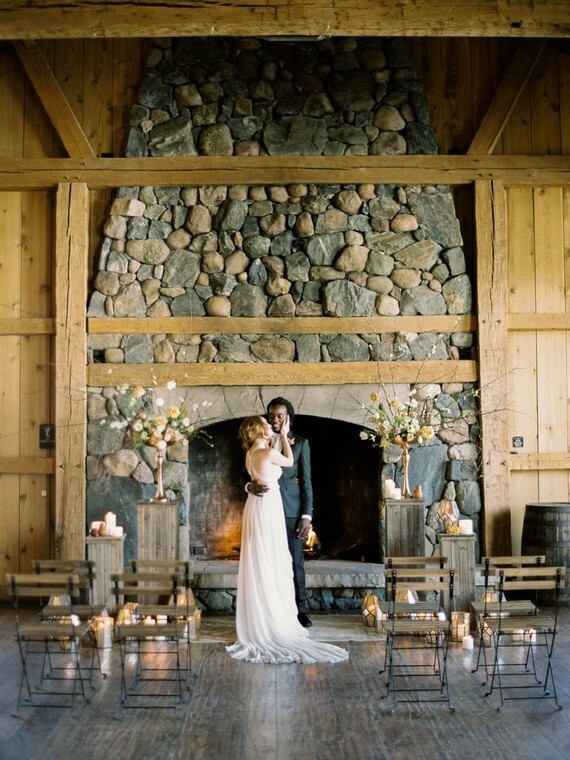 The stylists created a classic Colorado ambiance, added mountain-rustic chic and a modern elevated feel. They set the tone with leather, wood, and warm tones combined with an airy gown, sharp suiting, and clean paper goods. And of course, ethereal florals by the talented Prema Style. The color palette was neutral, with a variety of different flower textures, organic greens, and seasonal blooms. The stylists mixed muted metallics into candles and decor elements with warm lighting to set a romantic, luxurious mood. I love the dimensional wedding centerpieces of neutral and muted tone blooms and black candles – looks so edgy! The wedding cake was a minimalist white one topped with fresh neutral blooms. The post Modern Rustic Winter Wedding Shoot appeared first on Weddingomania.